“Acchu Murukku” also known as “Achappam” or “Rose cookie” is a mild sweet Murukku, normally prepared during Christmas time. 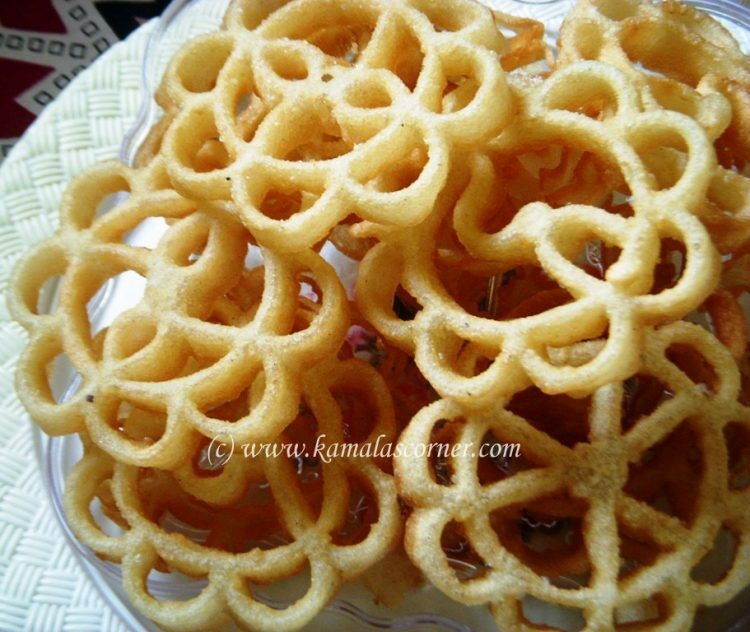 To prepare this Murukku, you will need a special mould fixed on a long handle that can be dipped in hot oil. When you put the mould in the hot oil, the mould become very hot and you have to immediately dip the hot mould in the batter. Due to the heat in the mould, the batter tend to stick in the mould and when you again put the batter sticken mould in the hot oil, the batter will get fried and after sometime, it will come out from the mould. Sieve both rice flour and maida. Put it in a bowl. Add powdered sugar, salt and til seeds. Mix well. Add coconut milk and make a batter. If required you can add little water. The batter should be like dosa batter consistency. Ensure that the batter should not be too thick or too thin. Heat oil in a kadai. Place the mould in the hot oil for a minute. Take out the mould and dip half of the mould into the batter and again put the mould in the hot oil. After few minutes, if you shake the mould the murukku will come out from the mould or using a fork just lift it from the mould and fry till it is crisp. Finish all the batter like this. Note: Never dip the mould fully into the batter. Care should be taken to imerse only half of the heated mould into the flour batter and then dip this into the hot oil.Then easily the flour will drop into the hot oil. I like all your receipes,madam… I did modaks for ganesha chathurti and it turns welll….Thanks!!!! Thank you Kamalini for your kind comments and nice to hear that the modaks turned well. Hi, this is one of my favorite snack…. Seeing ur eggless receipe , I was so excited to try that. I got a new achu but the batter keeps sticking to the achu and is not coming of. Please tell me how to use with the new achu. You can keep the Mould in hot oil for sometime and remove. Wipe it out. Then try the murukku. The Oil should be hot when you put the mould so that the outer flour get fried and tend to leave the mould. Ya I tried that way, but the murukku flour is getting fried and not leaving the achu 🙁 is there anything else that can help me with this new achu? Preheat oven to 400F . Coat the mold with oil and let put it on a baking tray covered with foil. Let it bake for 1.5 hours. Now the mold is ready for use. If the mould is new, keep it in dosa batter for a day ,then wash it nicely and apply oil in all sides.keep this for another day then use it. You may try these methods. Hi Savitha. Please note Mr Sebastian’s advice on how to dip the mould in the batter. Hope it will help you. I think Savitha’s problem of the flour not leaving the mould is due to the fact she dips it fully into the batter. Care should be taken to imerse only half of the heated mould into the flour batter and then dip this into the hot oil.Then easily the flour will drop into the hot oil. Kamalaji-Many thanks for the addition of Christmas cookies recipes in your blog as Kamala’s corner has become very popular among people of all communities including Christians (ladies as well as gents).Keep up your good seervice and compliments of the season. Thank you Sebastian for your encouraging words. Also thank you for the clear instructions on dipping the batter. I will include this also in the post. Can we use store roasted rice flour (idiyappam flour) for making achu murukku?